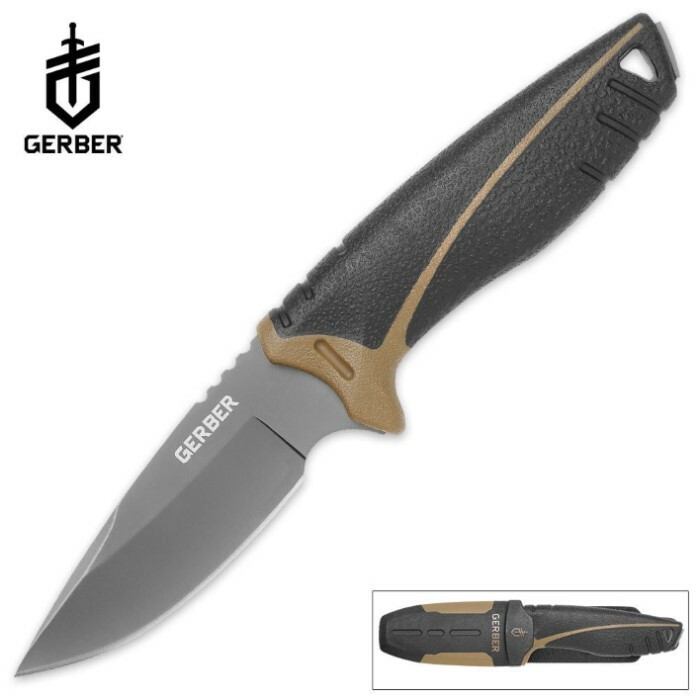 Gerber Myth Hunting Knife | BUDK.com - Knives & Swords At The Lowest Prices! The Gerber Myth hunting knife brings sleek new curves to the classic hunting knife. An over-molded handle offers a great grip to the slim profile of this ergonomic blade. A deep finger choil allows you to choke up on the knife and make precision cuts while resting your thumb on the notches in the back of the blade. The high-carbon 7Cr17 stainless steel is razor sharp and titanium nitride coated for corrosion resistance. Includes a locking sheath with built-in sharpener and retention strap.